I believe terminating quarterly reports is the right move, but for the wrong reasons. Forget managerial myopia. There is a much better reason to scrap quarterly reports: they aren’t useful anymore. These reports, and earnings in particular, have lost in recent years much of their relevance to investors, due to misguided accounting rules. Let me suggest a modified approach: Eliminate quarterly reporting but maintain a three months disclosure of company sales (revenues). Eliminating quarterly reports won’t reduce corporate managers’ myopia (short-termism), simply because managerial short-termism is a myth. The empirical evidence on short-termism is weak and mixed, at best, and several studies reject it outright. But you really don’t need any elaborate research to dismiss managerial myopia - just common sense. Would managers, allegedly obsessed with increasing quarterly earnings, invest over $2.0 trillion (yes, trillion) annually in long-term intangible assets (R&D, IT, brands, designs, unique business processes), when much of this investment hits the bottom line (expensed in the income statement)? Of course not. (The calculation of aggregate investment in intangibles was performed by economists Carol Corrado and Charles Hulten.) Just the aggregate annual investment in R&D - all expensed by accountants - exceeds $350 billion. And if managers are short-term oriented, increasing quarterly earnings at the expense of long-term growth, how to explain the decades' long growth in U.S. corporate sales and earnings? If this is short-termism, let’s have more of it. So, forget managerial myopia. There is a much better reason to scrap quarterly reports: they aren’t useful anymore. To prove my point, I conducted the following analysis (with my colleague Feng Gu): If quarterly earnings - the crown jewel of financial reports - reliably reflect corporate performance and growth, as widely believed, then investing ahead of time in companies with excellent earnings should be a winning strategy. Indeed, that’s what most investors and analysts strive to do. So, what are the returns on such an investment strategy? 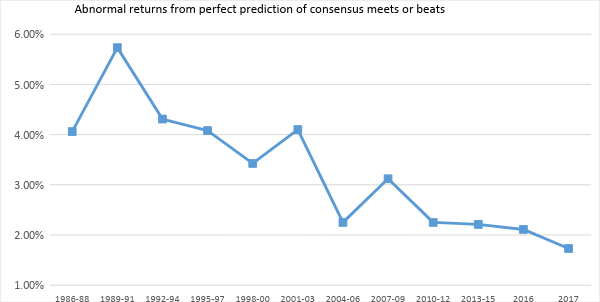 The figure below portrays the average returns from investing each quarter (1986-2017), two months before quarter-end, in all the companies which will subsequently meet, or better yet beat analysts’ consensus earnings estimates. Obviously, these are companies reporting very good performance. The investments are liquidated after the publication of the quarterly report (roughly a 3 months investment holding period). Gains from this strategy are portrayed in the following figure. What is astounding is the sharp decline in the gains from a perfect prediction of good quarterly earnings. From 6% abnormal (risk-adjusted) returns in the late 1980s (annualized returns of 25-27%) to 1.7% currently. But note, no one can actually reap the 1.7% gain, since it requires a prediction of all the companies that will meet or beat the consensus - a pipe dream. With your best spreadsheets and earnings prediction models, you may get a small fraction of the 1.7%, namely virtually zero! And that’s exactly my reason for scrapping quarterly reports: these reports, and earnings in particular, have lost in recent years much of their relevance to investors, due to misguided accounting rules, in particular, the immediate expensing of all internally-generated intangible investments (remember the $2.0 trillion), as well as the relentless drive of accounting regulators to fair value assets and liabilities, burdening the financial reports with ever-increasing managerial subjective estimates - mostly unreliable and sometimes manipulated - and loading the income statement with a host of one-time items indicating nothing about the future. With such usefulness-challenged quarterly reports, scrapping them will not result in a significant information loss to investors or a decrease in corporate transparency. In fact, I suggested this move two years ago in The End of Accounting (Wiley, 2016, pages 206-208). What will be the benefits from eliminating quarterly reports? Quite a few. For starters, cutting in half the wasteful and futile “earnings game,” where managers “walk down” analysts’ consensus estimates, only to beat them subsequently with often “managed” earnings. Unsuspecting investors fall into this trap, buying/selling on the earnings news, only to see most of those gains quickly reversed. A totally futile and costly activity. Furthermore, eliminating quarterly reports will increase CEOs’ and CFOs’ time available for important decisions, which is now wasted on the regulatory complex publication of quarterly reports, the elaborate preparations for the quarterly earnings calls with analysts and investors (a CEO told me recently that he spends three days in preparation for these calls), and all the angst involving these calls. Terminating quarterly reports will likely also mitigate earnings manipulation aimed at meeting the consensus estimate or earlier guidance. Internationally, there are several developed countries which don’t require quarterly reports, like the U.K. True, the U.K. economy is substantially smaller than that of the U.S., but the U.K. stock market is fairly large; roughly a third of the U.S., and I am not familiar with any study showing that U.K. capital markets are less transparent or efficient than U.S. markets for lack of quarterly reports. Finally, let me suggest a modified approach: Eliminate quarterly reporting but maintain a three months disclosure of company sales (revenues). This will allow investors to gauge the general direction of the enterprise, while doing away with all the cumbersome and costly requirements of quarterly reports and all the wasteful “management” of quarterly earnings. Better yet, accompany the quarterly sales figures with more meaningful performance indicators, such as the number of new subscribers and churn rates for telecom, Internet, and insurance companies, same-store sales data of retailers, or the order backlog of manufacturers. All in all, eliminating quarterly reports will be beneficial to both companies and their shareholders, and the world will not come to a standstill.